Nasa's Juno spacecraft will execute the second of two big burns on its main engine on Tuesday. 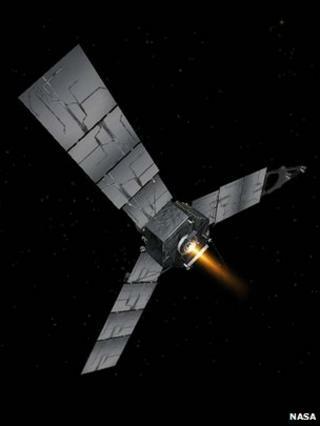 The manoeuvre will put the probe on a path to flyby Earth in October next year. This sweep around the home planet will then give the mission a gravitational boost and the velocity required to get it out to Jupiter in July 2016. What you might not know is that this critical event depends on British-designed and -built hardware. Juno is equipped with a Leros-1b apogee engine prepared by Moog-ISP of Westcott. Westcott has a rich history. It was at the old Buckinghamshire RAF base after WWII where the government established its guided weapons programme, producing solid motors and liquid engines. Today, this quiet corner of England is developing propulsion systems for important spacecraft like Juno. The Jupiter probe's Leros-1b was originally designed to put telecommunications satellites in the right part of the sky. When these platforms are dropped off by their launch rockets they are in a large ellipse around the Earth running from just a few hundred km above the planet out to 36,000km. An apogee engine makes a series of burns at the top of the ellipse to circularise that orbit and bring the satellite into a "stationary" parking position where it can then relay its TV pictures, phone traffic, broadband, etc to a particular region, 24/7. The major American manufacturer Lockheed Martin was the first to use the high thrusting (635 newtons) Leros-1b on its telecoms platforms, but the engine has also found favour at the US space agency down the years. The Mars Global Surveyor, which mapped the Red Planet from the late 90s, and the Near-Shoemaker probe, which visited an Asteroid Eros in 2003, both carried the Westcott technology. Of those Nasa missions in action today, the Messenger venture at Mercury has a special reason to thank its Leros hardware. "It was a proud day for us to know that our engine actually did the insertion burn to drop the spacecraft into the correct orbit. "The engine braked the orbital speed. It was a delta-v opposite to the direction of travel and that slowed Messenger enough so the relatively weak gravity of Mercury could capture the spacecraft and put it into an elliptical orbit around the planet rather than the Sun." The Leros-1b on Juno will be required to do something similar in July 2016 when the mission arrives at Jupiter. But first it must put the probe on the right path to the Gas Giant. Juno was launched in August last. It has since travelled some 480 million km from Earth, beyond the orbit of Mars. Two 30-minute burns of the hydrazine-fuelled Westcott engine - the first was conducted last Friday - will bring the spacecraft back towards the home planet for a classic gravitational slingshot out to Jupiter. "We're pretty much hands off at this stage," Dr Coxhill says. "Nasa's mission control is running things. If they see something they don't like - such as temperature readings that are too high - they might give us a call. "We always like to get some feedback, which is not always possible because of security restrictions, and we understand that. But we put blood, sweat and tears into making our engines and just hearing there was a 'nominal burn' gives us a warm feeling." Moog-ISP now produces a 1c derivative of the Leros as well. This is trimmed for slightly less thrust (450N). It was fitted to the Boeing-built Intelsat-21 and -22 telecommunications spacecraft that were launched in August and March of this year. You will see the 1c on the next generation of the US DoD's Global Positioning System (GPS) satellites, also - GPS-III. "We're an export business. We're a UK company that makes most of our money selling into the US," emphasises Dr Coxhill.